If you know exactly what you need, you can create your own Jet kit for your motorcycle here. 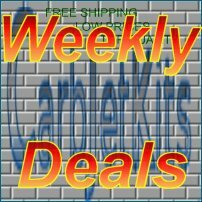 Make your own Jet kits are generally cheaper then our basic or Ultimate jet Kits. Start by selecting the Main Jet (keihin type 99101-393) size below. Complete your Jet Kit by adding shims, pilot jets, tools,..
Then select how many you need by adjusting the quantity. Please note that the Make your Own jet kits are not elegible for return!